Humboldt Gardens is a groundbreaking green community of townhomes, flats, and apartments built around a central pocket park. 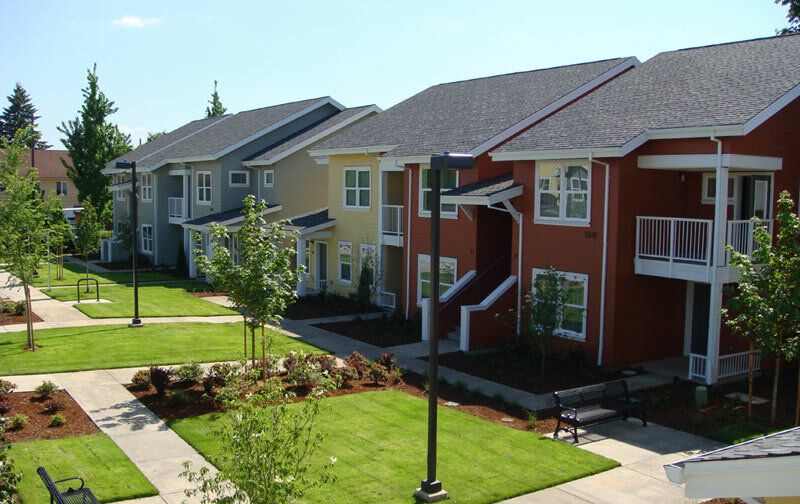 Developed to replace the badly aging and inaccessible Iris Court apartment complex off Vancouver Avenue in North Portland, Humboldt Gardens is Portland’s second redevelopment effort anchored by a federal HOPE VI grant. Designed from the ground up with input from the entire community, the site incorporates a high number of green features such as low-flow showers and toilets, storm water swales, and Energy Star appliances. Sustainability - LEED Gold for mixed use building; first-of-their kind bioswales combine public and private stormwater filtration; energy savings from solar panels that produce electricity for community spaces in the mixed use building. Humboldt Gardens is a location for Home Forward’s Opportunity Housing Initiative, a support program that asks participants to set life goals and move beyond housing assistance to economic self-sufficiency. Albina Head Start operates a program on-site for Humboldt Gardens and neighborhood children. Human Solutions provides case management services for the 20 Bridges to Housing family households. Humboldt Learning Garden is taking root on a lot adjacent to Humboldt School and across the street from Humboldt Gardens.